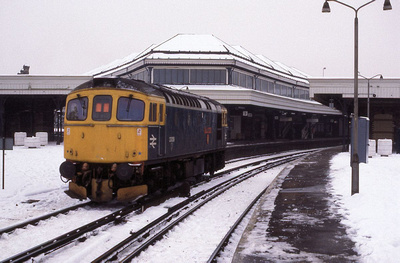 16 years ago.......with a smattering of snow on the ground an unidentified class 47/8 arrives at Gatwick with 1O66 the 0717 Manchester Piccadilly to Brighton service. 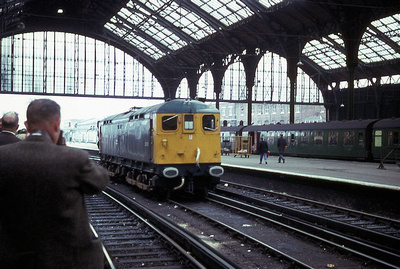 An unidentified class 73/2 waits to depart with the 1235 to Victoria. Photographer unknown / Webmasters Collection. With some snow lying in the fields 33111 is captured on Honiton bank with a Waterloo to Exeter St Davids service. Slide dated 21/1/79 photographer unknown / Webmasters collection. Departing Chichester with the 1234 Brighton to Portsmouth Hbr service is 4VEP 7733. Photographer P.Barber / Webmasters collection. Taken from a passing train, withdrawn 4COR 3158 is seen in the sidings at Lancing. This is the site of the former LB&SCR carriage works. 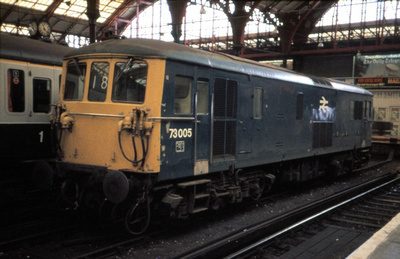 73005 sits between platforms 2 and 3 at Brighton station in the now non existent loco road. 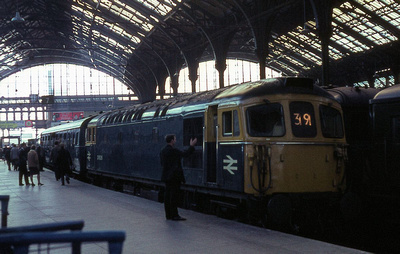 An unidentified 4VEP occupies platform 3. Slide dated 1980. Photographer R Marsh / Webmasters collection. 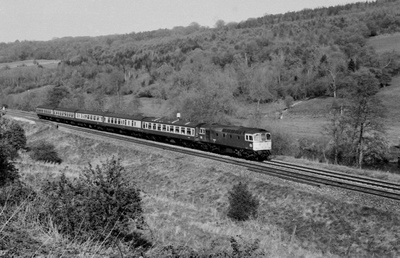 When there used to be proper long distance services to and from Brighton, 33020 is captured in charge of 1O96 the 1510 Cardiff Central to Brighton service at Dundas near Bath. Image dated 23/4/88. Photographer Graham Roose / Webmasters collection. An extremely rare visitor to the southern end of the Brighton mainline, 37109 approaches Mill Road Brighton with an excursion from Great Yarmouth. Photo taken 5/12/81. January 2013E6048 ( 73141 ) is waiting to depart from Seaford with the 'Bulleid Commemorative Railtour' Full details can be found on the ever helpful Sixbells Jct website- www.sixbellsjunction.co.uk/60s/680608bp.html Image dated 8/6/68. In bright sunlight 6B Hastings DEMU unit 1033 is captured at Exeter St Davids having just arrived on the 0900 (SO) service from Brighton. 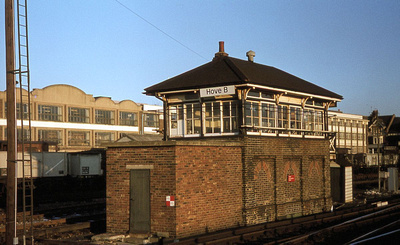 A couple of photos of our 'home' station London Rd, whilst undated they are likely to have been taken during the early 1970's. 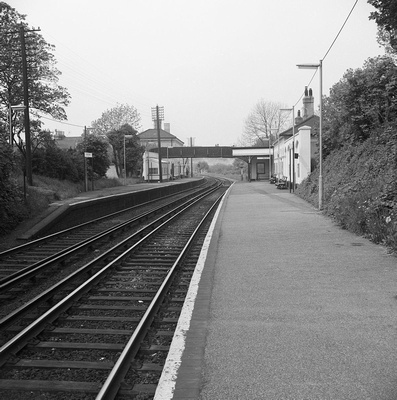 Top view is of the Lewes bound platform buildings, now demolished. The bottom view is looking towards Brighton. Haywards Heath station and a damp October evening. 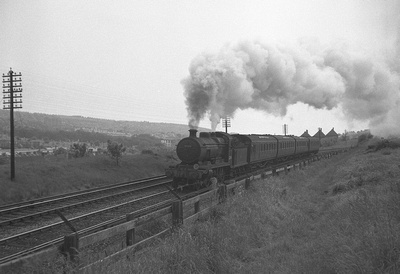 2HAP 6044 and a sister unit form the 1828 departure to Seaford. The signalmans bike can be seen propped up against the box. Slide dated 9/10/81. Another Black and White image, this time of 5BEL: 3053 at Seaford, alongside berthed 4CIG 7305, whilst working the RCTS 'Brighton Belle Commemorative Railtour. Image dated 8/4/72. 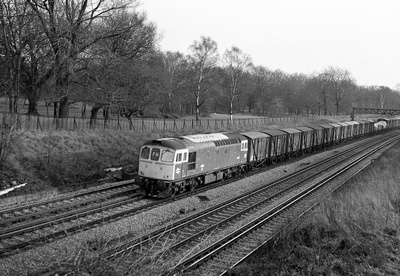 73111 trundles through Cooksbridge with a single Yugoslavian Ferry Wagon in tow. 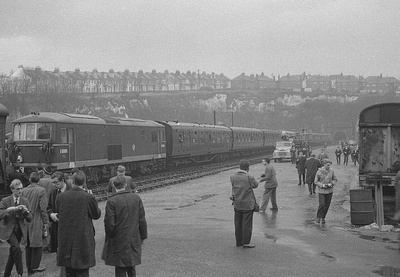 The wagon is believed to be loaded with furniture and bound for Newhaven and the REMPLOY factory. 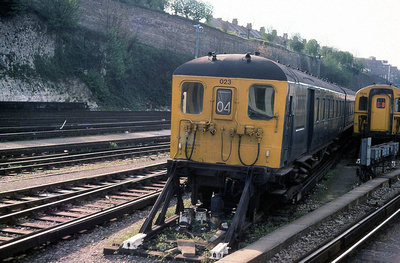 Slide undated but post 1984 as the loco appears to have been fitted with arc shutes. 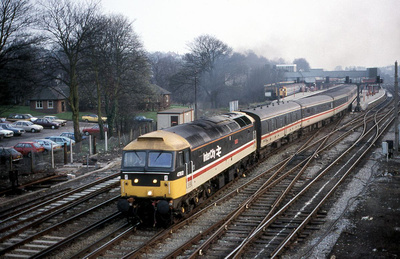 These were fitted after the Gatwick Express service started and the Class 73's had a tendency so set themselves alight due to the arcing from the shoegear. Click on the picture for a larger image. Three Bridges yard has been out of use for a few years and is now having a new lease of life by being converted to the new Thameslink ( south ) depot. The down yard on the left is for carriage cleaning and berthing stock. 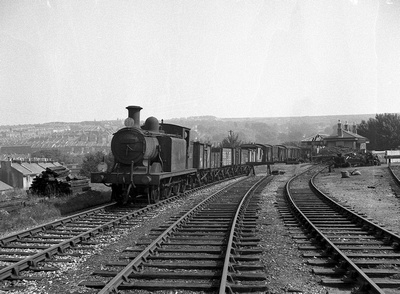 The up yard on the right is the maintenance depot and wheel lathe. This is a view of progress so far. 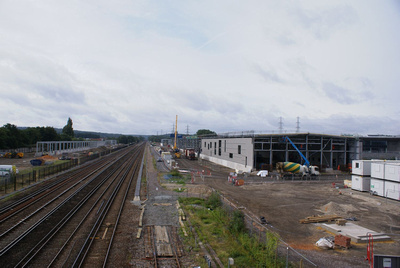 Image taken on the 15th August 2013 on a visit to the Network Rail Regional Operating Centre, out of view on the right. Looking forward to better weather and the summer 50018 'Resolution' heads along the seawall at Dawlish with the 0933SO Plymouth to Brighton. The sewall at Dawlish is currently breached with the winter storms. 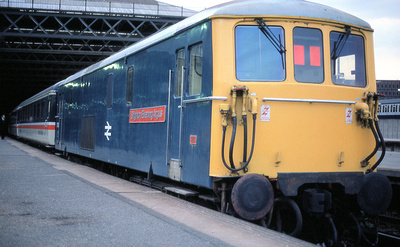 Image dated 27/5/89. A Yorkshire view. 45135 '3rd Carabiner' waits to depart Hull with 1J01 the 1324 to Brighton, yes Brighton. 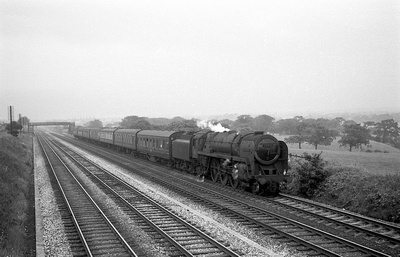 This train attached at Sheffield to a portion from Leeds. 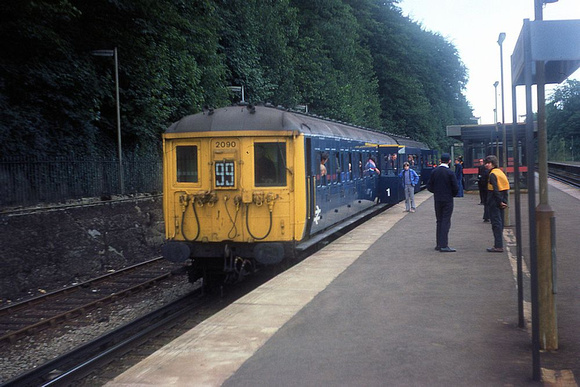 The train ran for 2 years May 1984 - May 1986 and was formed of a service that originated from Paddington! 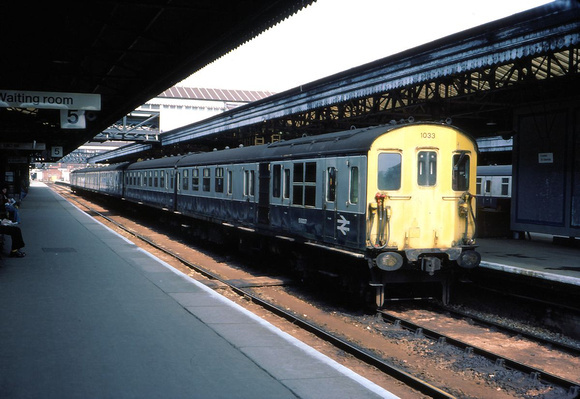 The only mystery with the photograph is why is formed of Mk1 stock instead of the usual Mk2 aircons? 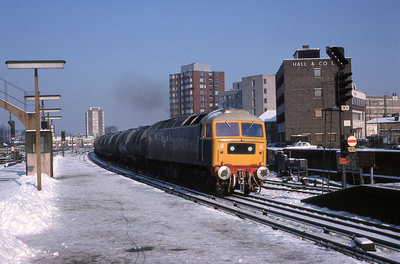 Image dated the 18th January 1986 a Saturday.... maybe engineering works. 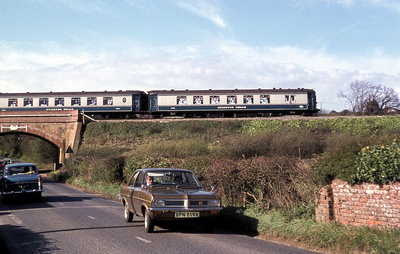 5BEL 3053 crosses the A259 near Pevensey with an RCTS railtour. Nice selection of 1960's and 70's cars. 47612 'Titan' gets away from Redhill with the 1826 Brighton to Liverpool Lime Street. 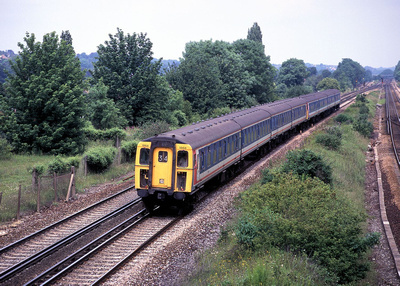 This was the only northbound cross-country service from Brighton that was routed via Redhill. 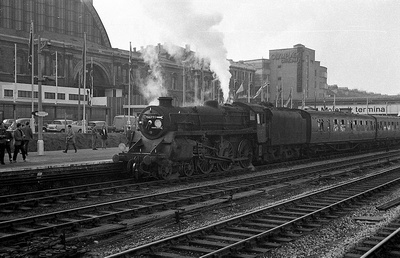 It was mainly to pick up the mass of mail and parcels traffic from the sorting office there, bound for the North West. 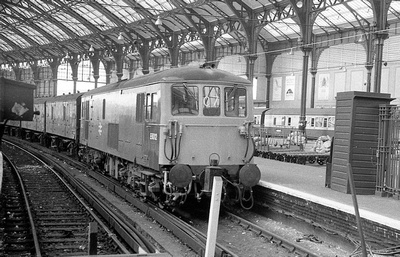 BR Standard class 7 70003 'John Bunyan is captured at Euxton with 1X46 a Glasgow to Kensington Olympia extra, this may have been while Euston station was being rebuilt for the West Coast mainline electrification. 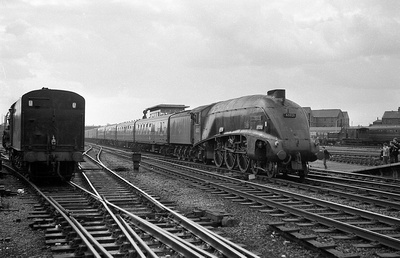 The train consists of former LMS stock and a BR Mk1 still in blood and custard livery. Is the webmaster going soft in his old age.........Two months in a row with a Kettle! Well I liked the subject matter.......................A4 Pacific 60021 'Wild Swan' passes through Doncaster station with the down Anglo Scottish car carrier from London Caledonian Road to Edinburgh Waverley. The car transporters can be seen towards the rear of the train. Three months this year I have managed to get a steam loco as POTM...whatever next. This latest one shows 'Black 5' 45097 passing through Preston Park station enroute to Brighton, the train consists of former GWR stock......Birkenhead - Brighton service or maybe an excursion? Volks Railway and a 2 car train passes through the shed at Paston Place, enroute to the Aquarium. The driver wrapped up for the 'inclement weather' is the Webmasters Late Father. 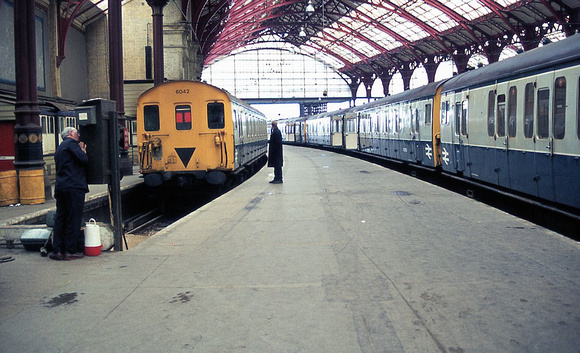 A rather empty Brighton station with 2HAP unit 6042 in platform 1 and 3 unidentified sister units in platform 2. 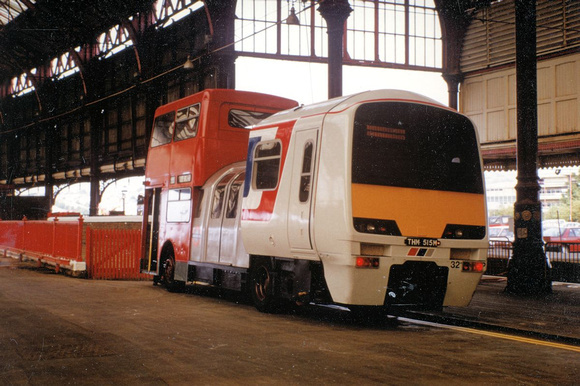 Half class 321, half tube train and errrrr half DMS Bus! The London Travelcard publicity bus is parked in the cab road at Brighton station. 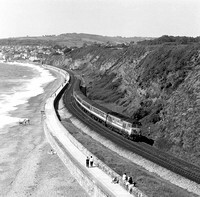 Image dated 21st September 1991 for the Brighton line 150 celebrations , Photographer Richard Sanders, used with permission. 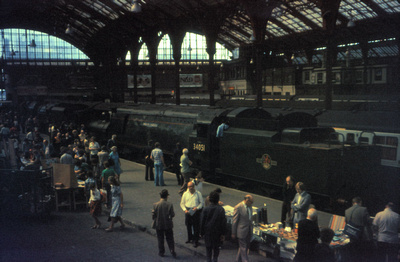 Brighton station and the Southern Counties Touring Society Railtour 'The South Eastern Rambler. 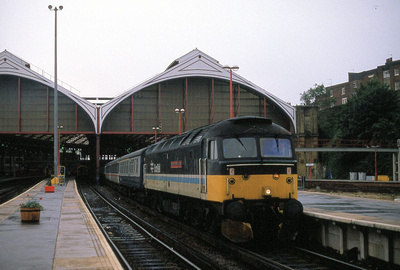 The railtour started at London Bridge, finished at Victoria and encompassed many routes in Sussex and Kent. 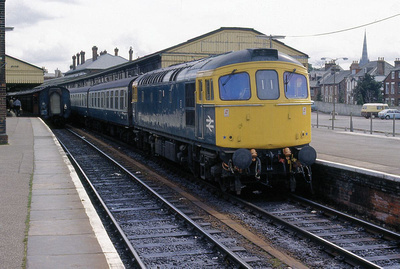 Passenger accommodation was 4TC 422 reduced to a 3 car formation with traction from class 33 D6529 ( 33112 ). 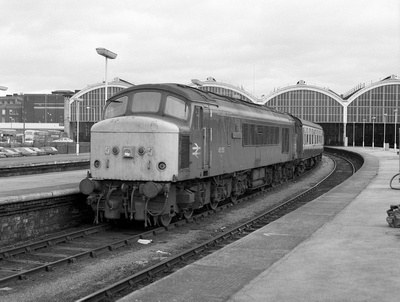 Railtour date was 22/10/67. Photographer unknown. 2HAP 6034 and a sister unit approach Southease station enroute to Seaford. Slide undated, Photographer unknown / Webmasters collection. 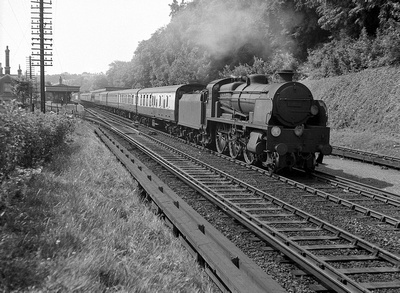 Battle of Britain 'Biggin Hill' 34057 is captured passing Lymington Junction at Brockenhurst with the 0940 Brighton to Bournemouth service. 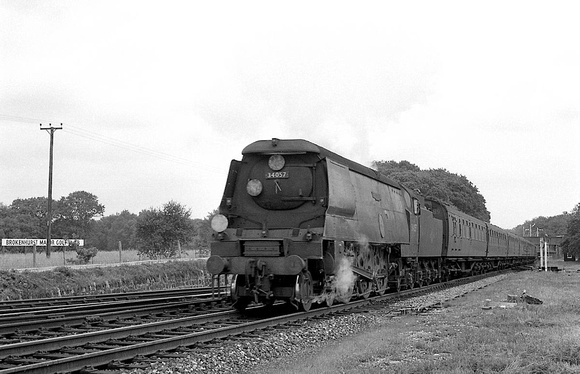 Image taken 28/7/62, Photographer unknown / Webmasters collection. 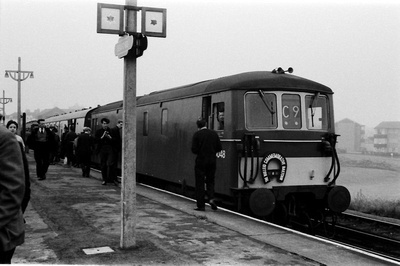 2BIL 2039 along with a sister unit pause at Barnham with an unknown service. Image taken 1960's, Photographer unknown / Webmasters collection. 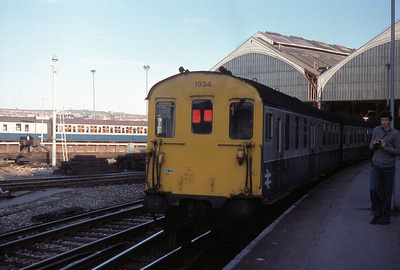 Class 47 136 is captured at a deserted looking Brighton station with an unidentified excursion from somewhere west. Image circa 1977, Photographer unknown / Webmasters collection. More steam whatever next! 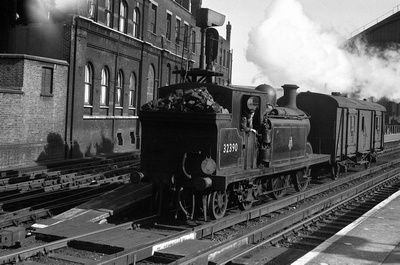 Former LBSCR E3 loco 32165 is captured at Lewes Road station on the Kemptown branch, just round the corner from our clubrooms, with a mixed goods train returning to Brighton. Medium format negative dated September 1953. Photographer unknown / Webmasters collection. Yes, steam two months in a row! 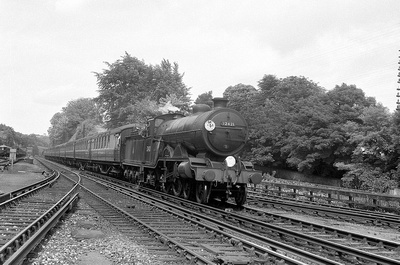 D1 class loco 31727 is seen passing over Keymer Junction with an unidentified up service. 6x9cm medium format negative. 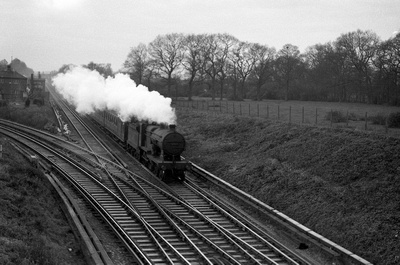 Image dated December 1955. Photographer unknown / Webmasters collection. Approaching the station stop at Oxford is 47445 with 1M07 the 1348 Brighton to Manchester Piccadilly cross country service. Slide dated 31/8/83. Photographer unknown / Webmasters collection. 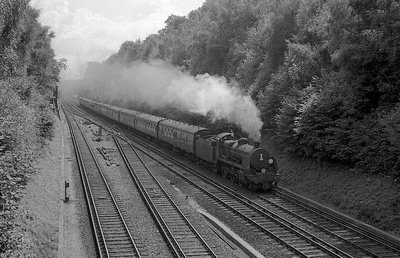 Just north of Mill Road, Patcham, we find K class 2-6-0 32350 with a short freight train. 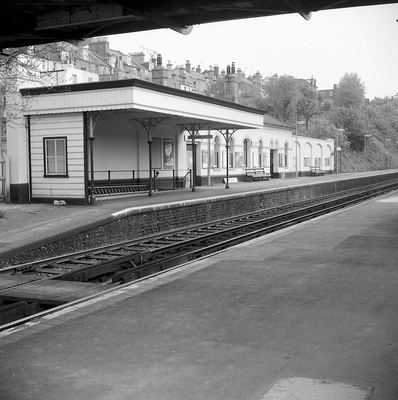 Medium Format 6x4.5cm negative dated August 1952. Photographer unknown / Webmasters collection. 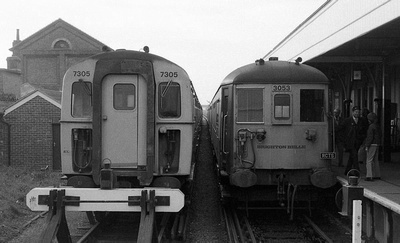 Taken from a passing train Deicer unit 023 and 4BIG 7033 are captured in Lovers Walk Depot, Brighton. 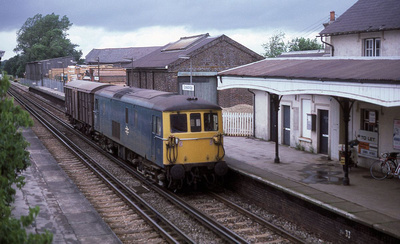 Image dated May 1977. Photographer unknown / Webmasters collection. The new order on the Brighton main line 700108 forms the late running 0932 London Bridge to Brighton Thameslink service on 21/6/16. These new trains will take up many diagrams over the coming weeks and months. 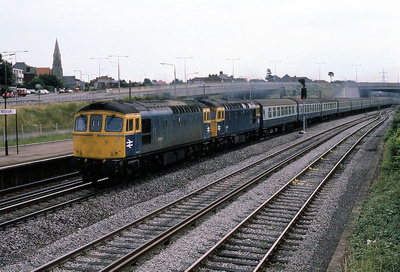 Photographer Andy Gibbs / Webmasters collection. Hollingdean, looking down the valley towards the Lewes Road with the terraced houses of the Coombe Rd / Bear Rd area in the background. 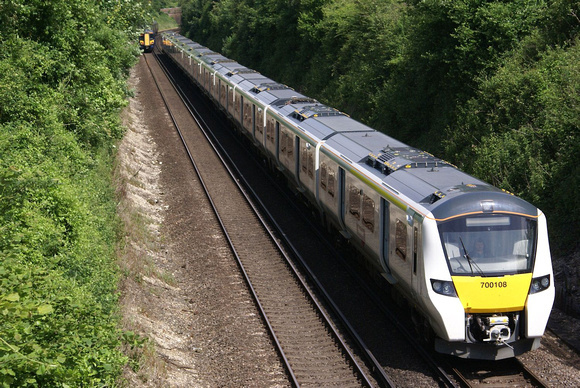 K Class 32344 works hard uphill towards Falmer with a Brighton to Tonbridge service. Dated May 1952. Photographer unknown / Webmasters collection. The loco road at Brighton and SR Electric loco 20001 formerly CC1 is being photographed whilst on a railtour. Slide taken 8/6/68. 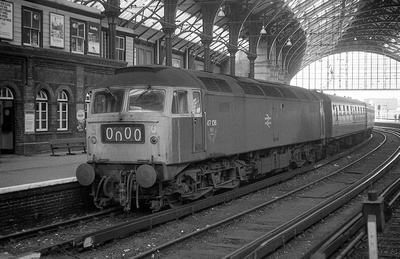 D3 32390 shunts a single BY van at Brighton, from a 6x9cm negative dated September 1953. Photographer unknown / Webmasters collection. 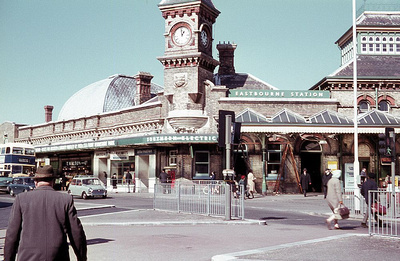 Photo of the Month December 2016:- Despite the signage this view of Eastbourne station only dates from 23/7/71. ...Ok so that's 46 years ago! Photographer unknown / Webmasters collection. Photo of the Month January 2017:- Preston Park is the location for this view of Brighton Atlantic 32421 with a train formed of former LNER stock, probably from Leicester. 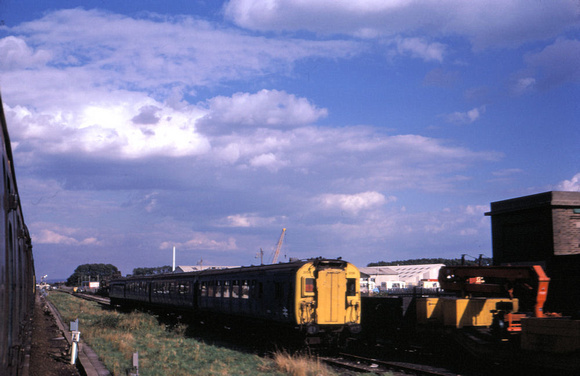 The EMU stock berthed in the sidings to the left suggests a weekend day. Medium Format negative dated June 1955. Photographer unknown / Webmasters collection. 2BIL unit 2090 is captured at Lovers Walk Depot. Plenty of parcels stock in Top yard to the left. Slide taken 10/9/77. Photographer unknown / Webmasters collection. Running about 20 mins late Black 5's 44871 and 45407 head to Eastbourne with 1Z70 the 1043 from Victoria. 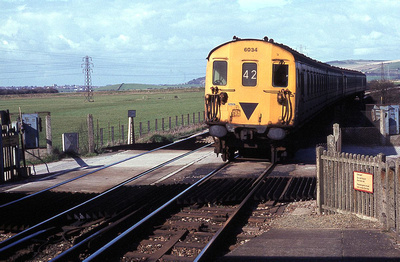 The scene is captured at Beddingham on more or less on the site of the old level crossing. 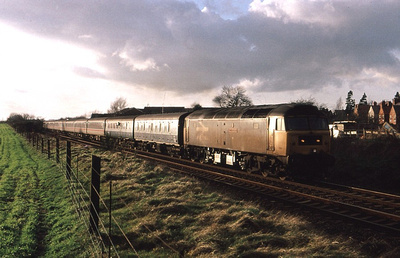 Railtour operated by WCR on behalf of The Railway Touring Company. 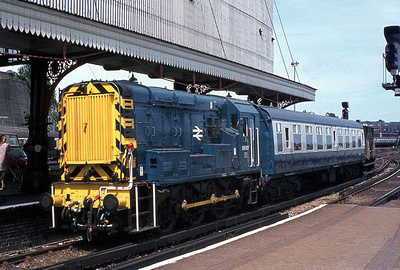 47802 was on the rear of the train. 6/12/16.Photo by the Webmaster. OK not a train but a bus this month and not far from our clubrooms too............a Southdown Leyland Leopard is in the queue for the traffic lights at the bottom of Preston Drove. Service 170 was the service to and from East Grinstead. Caffyns were the main British Leyland dealers in Sussex, they still exist unlike BL. The garage still stands but is now a branch of Sainsburys. 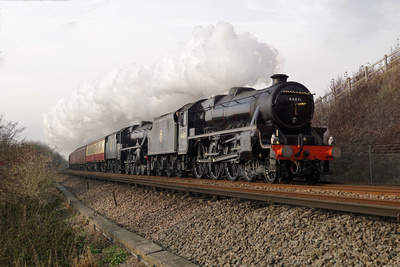 Backing up to Preston Park station is LNER K4 loco 3442, it will then take the Marquis Goes South Southwest Railtour on to Chichester. 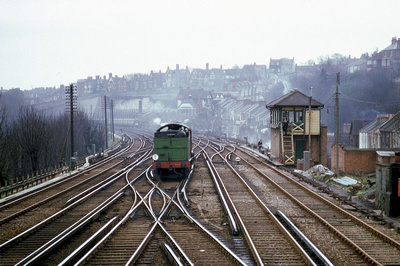 The signalbox has long gone, the trees have grown somewhat and the track layout here is much simplified now. Photographer unknown / Webmasters collection Date 12/3/67. 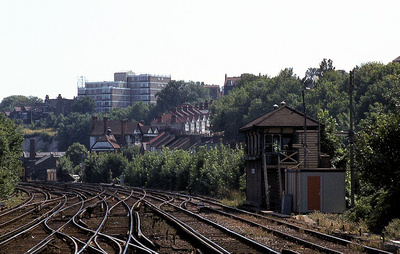 Looking south from Preston Park station towards Brighton. 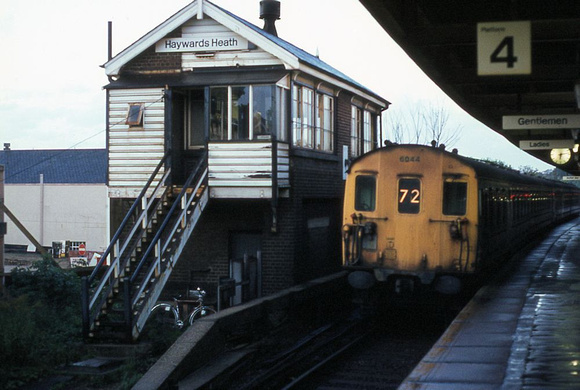 On the right is the signal box that closed in March 1985. 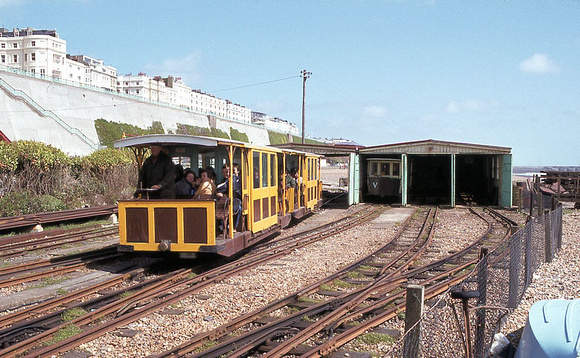 The picture is prior to the Brighton line resignalling of the 1980's that simplified the track layout here considerably. 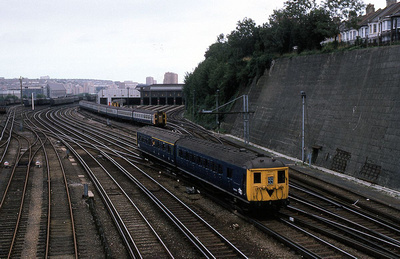 Image dated August 1983 Photographer unknown / Webmasters collection. Looking south towards Kensington Olympia at White City we find class 33's 33037 and 33057 heading towards Willeden with a long train of International ferry vehicles from Dover. 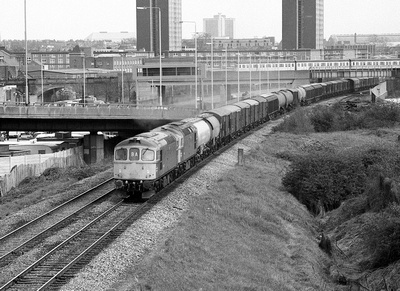 Image dated 12th April 1982. Photographer unknown / Webmasters collection. Photo of the Month June 2018:- 4CIG 1868 leads a sister unit on a Victoria to Brighton stopping service at Stoats Nest Junction, Purley. Date circa 1994. Photographer unknown / Webmasters collection. 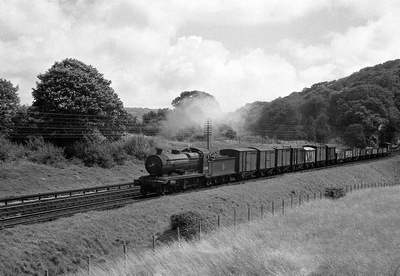 Photo of the Month July 2018:- Captured just north of Patcham Tunnel is L class 4-4-0 31763 with a short train, a portion of the Birkenhead to Hastings service. 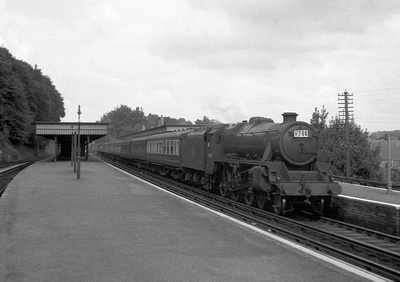 This was detached at Redhill. dated June 1958, Photographer unknown / Webmasters collection. Photo of the Month November 2018:- 73101 'Brighton Evening Argus' rests at London Bridge with a Gatwick Express test train, prior to the introduction of the service. Dated early 1984. Photographer unknown / webmasters collection. 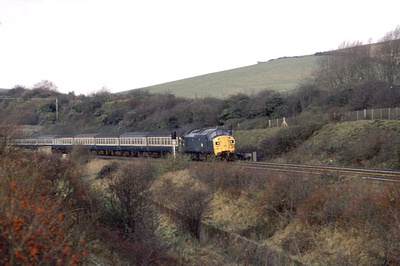 Montpelier sidings at Brighton and 4CIG 7318 can be seen alongside Class 73 E6036 ( later 73129 ) which is in the loco sidings. Dated October 1971. Photographer unknown / webmasters collection. 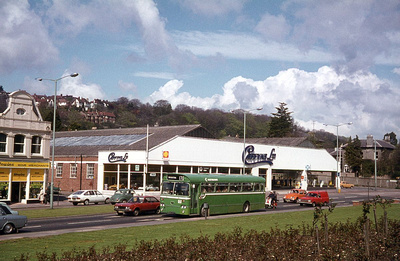 Photo of the Month January 2019:- For a change a bus photo from May 1969...nearly 50 years ago. 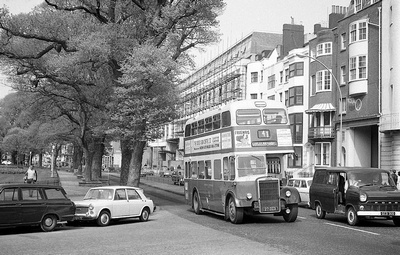 Grand Parade Brighton and Brighton Corporation 27CCD is operating on circular route 41. Photographer unknown / webmasters collection. 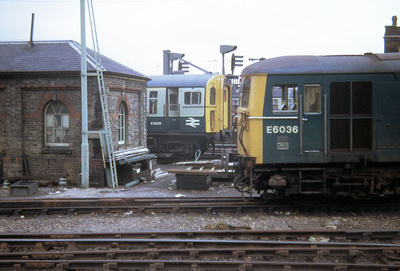 February 2019:- A Brighton station open day from the early 1970's. The locomotives stored in the Pullman Car Works at Preston Park were brought out into the open as exhibits for the day. 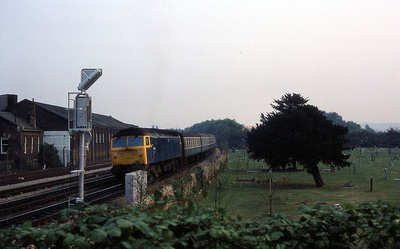 Photographer Andy Gibbs / webmasters collection.